More popular in Japanese game design than Western is the concept of the boss battle. I love them, and I'm sure many of you out there do, too. Nothing like creating an epic ending to a level or area than with a climatic battle to stimulate the senses. This brand-new segment of SuperPhillip Central highlights some of my favorite boss battles of all time beginning with five for today. Check back frequently as I plan on having this be a long-running series of articles. Now with that jargon out of the way, let's get to the action! The beginning of God of War II goes off with a big bang as Kratos finds himself stalked by a menacing statue known as the Colossus of Rhodes. As Kratos fights through wave after wave of enemies, solving simple starting puzzles in Sparta, and pilfering treasures from chests, the Colossus always has an eye of the God of War. Things come to a head when the Colossus slams its fist through a wall. Kratos must dodge this in a swift QTE segment. When Kratos enters the final battle arena, the Colossus smashes one of its fists down and the Ghost of Sparta must leap over it to avoid damage. 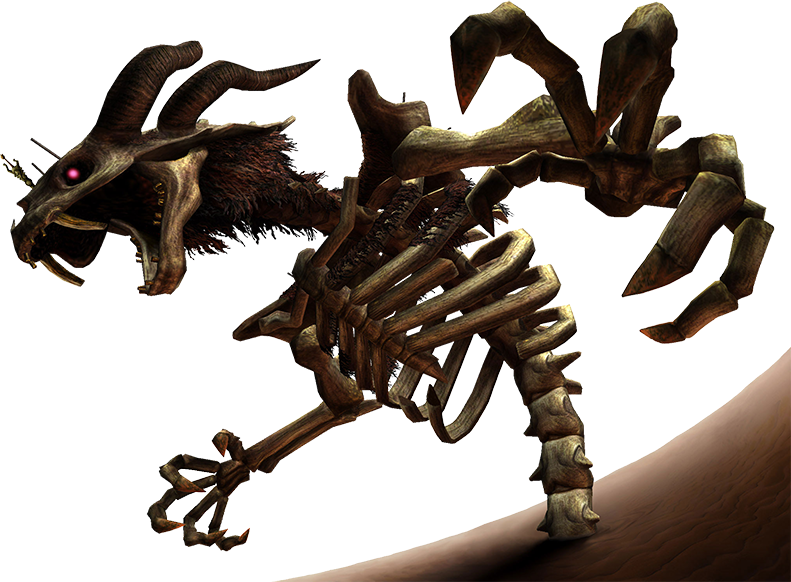 The boss then spawns enemies which Kratos must take down all the while avoiding the hand lunges of the Colossus. Each time the Colossus swipes its fist or fists at Kratos, Kratos should roll out of the way and then attack. This is the boss's opening. After enough damage has been inflicted, the Colossus goes offline for a short while. This moment gives Kratos the opportunity to leap up to a ledge where a rock catapult is conveniently placed. With a press of the R1 button, the catapult launches, slamming the rock into the Colossus's once perfectly-formed face. While the Colossus is stunned, Kratos jumps into the catapult himself and launches his body into the big bad boss where at quick time segment, if successfully completed, has Kratos striking the Colossus's eye with his weapon. However, the battle is just momentarily over. 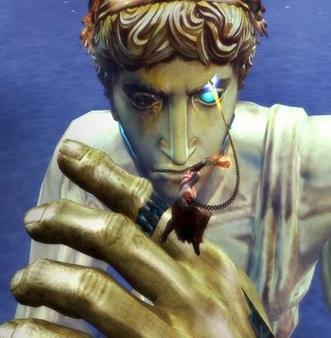 As Kratos steps into a room, the Colossus desires to step on Kratos with its monolithic foot. A mad press of the circle button keeps the player from getting squashed like a godlike bug. Once Kratos scales a wall, the second part of the confrontation begins. The process is very much the same. The Colossus slams its fists down while Kratos rolls out of the way to then attack it. Once the mechanized beast has been slain for to stun mode, Kratos needs to swing over to its arm and activate another QTE. This process happens again. The final stage of battle begins with a blade sticking out from the top of a building. The Colossus slams its fists into the building's side, producing shockwaves that Kratos must hop over. Stunning the enemy will allow the God of War enough time to pull the sword from the rooftop and inflict the final blows to the agitated Colossus. So much for the grand Colossus of Rhodes! 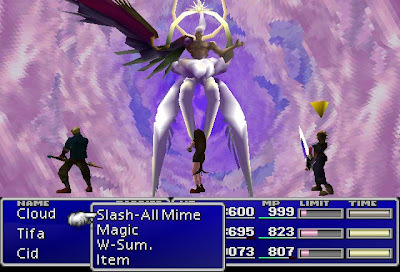 Considered the coolest baddie of any Final Fantasy game or a whiny, uncool mama's boy to others, Sephiroth's One-Winged Angel form (Safer Sephiroth) is the final test in Cloud and company's long, three-disc journey to save the world. After defeating the Birth of A God form, One-Winged Angel chimes in with chanting, an orchestral score, and the evil angel himself, ready to mercilessly destroy his enemies. 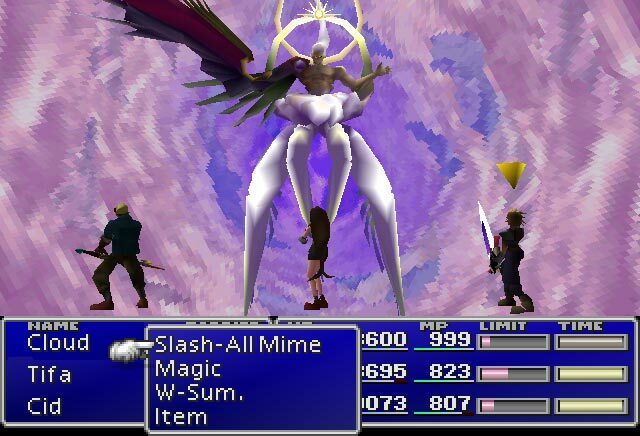 Without a doubt Safer Sephiroth's most powerful attack is his own brand of summon, Supernova. It's a catastrophic comet that comes from the depths of outer space and enters the Milky Way galaxy, obliterating each and every planet as it heads into the Sun. Once it enters the Sun, the big ball of light expands, completely engulfing Mercury, Venus, and what I will call Earth in an immense ball of fire. The attack will totally decimate low level parties and underdeveloped parties, so watch out. However strong Safer Sephiroth's attacks are, they will allow Cloud's party to reach their limit breaks, the strongest moves in the game, quite easily. Who doesn't love using 4X Cut with Omnislash to send Sephiroth back to Hell where he belongs? Not I. Once Safer Sephiroth is defeated, one last Omnislash does the humanoid form of Sephiroth in for good. So long, mama's boy! Located within the dungeon of the Arbiter's Grounds is a unique item for Link to acquire, the Spinner. With it, the Hero of Time can ride certain marked walls in stellar fashion. The Spinner itself has spikes on its sides on all 360 degrees of it, making it useful in combat situations as well. It's the key to defeating the nefarious Zant's newest creation, the Twilit Fossil, Stallord, in combat. The encounter starts out innocently enough. Zant revives the beast for battle, and Link must ride his newly-acquired Spinner and circle around the arena, avoiding the spikes circulating around the arena and spawning soldiers that Stallord summons and slamming into the base of the boss's spine to damage Stallord. After enough hits the mighty boss falls to the sand in agony. Do not celebrate just yet, however. The real battle is just about to begin! The second stage of combat starts off with Link using the Spinner to rise up a tall column in the center of the arena. Little doth he know that Stallord's head is right behind him, knocking him off the column and starting stage two of the battle. The column and outer perimeter of the arena has Spinner marks on them, allowing Link to use the useful and innovative item to climb the walls until Stallord's head comes into view. When his mouth is full of fire, be ready to leap to the opposite wall to avoid a fireball blast. Eventually, Link will be at Stallord's level, and by jumping to the other side, Link will slam the Spinner into Stallord's face, sending it to the ground below. Link must then hop off the Spinner, fall down, and strike the boss's weakpoint, Zant's sword which summoned the beast in the first place. After multiple rounds of this the Stallord will be permanently put to extinction, and victory will be Link's once again. Kefka is one of my favorite villains, and in Final Fantasy VI (which many consider one of the greatest RPGs of all time) he actually succeeds in destroying the world. After the heroes reunite after trekking it through Kefka's tower, the final battle is at hand. It's a four-part encounter that was highly impressive for its time. Players did battle with a selection of grotesque combinations of Espers. 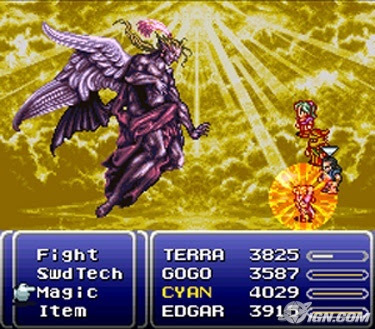 Each time a group was defeated, the player's party moved one step higher into the clouds, and the music shifted into a new movement of Dancing Mad. Once all three parts of the Esper monstrosities were put down, the final encounter took place. Kefka, with angel wings sprouting from his back, hovered down from the heavens. And with a menacing cackle, the fate of the new world was in the balance. As Kefka's hit points dwindle into nothingness, one last speech hits his sordid philosophies home. Terra and friends have defeated the sinister jester, and now they embark on remaking their broken world. Bowser has had his Koopalings keeping Mario and company busy while he does who knows what with the imprisoned Peach Toadstool. Now with Mario in the final hallway leading up to the King of the Koopas, Bowser gets desperate. He launches fireballs through the hallway that Mario and friends must avoid if they want a chance to right Bowser's wrongs. Eventually Mario reaches Bowser's innermost chamber where Peach is kept hanging in a cage. The battle begins with Bowser once again shooting fireballs that Mario must leap over. This battle can go one of two ways. The portly plumber can either shoot his own special brand of fireballs back at Bowser, or if that option is impossible, time it perfectly so when Bowser hops into the air, Mario can run under him, hit a switch, and send the Koopa King hurdling into the lava below. Peach is saved! Or is she? As Peach turns around, it is revealed that it's only Kamek disguised as her. That cross-dressing imposter! Suddenly as Kamek uses his wand, Bowser rises from the lava like a phoenix from the ashes in humongous and glorious form. The chase is on now! The screen slowly scrolls to the right as Bowser shoots off gigantic fireballs at Mario who flees for his life. These great balls of fire destroy anything they touch such as the walls and floors of the castle. By tricking Bowser into aiming his fireballs at Mario, Mario can sneak through the holes that the fireballs make. Soon Mario reaches the halfway point where an item box rests. The home stretch is in sight. Now floating platforms hover in the air, swaying back and forth, ready for Mario to jump on them. 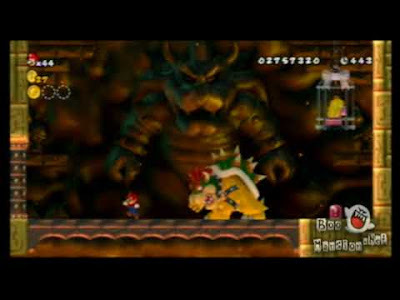 Timing is key as one false move and Mario falls into the lava or gets rocked by one of big Bowser's fireballs. Once Mario reaches the end, he steps on a button which sends Bowser falling to the abyss. Mario and Peach are reunited, and with air balloons in tow, they finally head home. A great ending to a great adventure indeed. Have a favorite boss encounter that didn't make the list? Of course you do! Why not share it with the SuperPhillip Central community? Just leave your favorites in the comments section, and I'll take it from there. Until next time, this has been Best Boss Battles in Gaming History!